SACRAMENTO, CA -- According to MarketWatch.com, the No on Prop 8 web site was "hit by a massive cyber invasion called a distributed denial of service attack (DoS) that took down the site for several hours last night, with the assault originating not just in-state, but from Texas, New Jersey and Georgia." 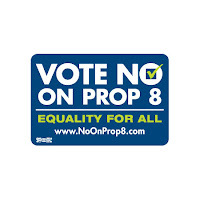 Although the "Yes on 8" side has not officially claimed any responsibility for the attacks, spokesman Bob Dacus claims that his side will stop at nothing "to prevent the homosexual agenda from first perverting the definition of marriage, then turning the U.S. into Nazi Germany and destroying Israel. Eventually, they'll destroy the world and then turn their sodomite ways towards other innocent planets." Tony Perkins, president of the conservative Family Research Council, has argued that California's Proposition 8 is "more important than the presidential election -- probably more important than anything else in the entire history of the world. Abortion, murder and terrorism are almost benign compared with the threat of gay marriage." Although Perkins also denies any responsibility for orchestrating the cyber attacks on the No on 8 website, he says the Bible is on his side. "Leviticus clearly says that two men shall not lie together like a man and woman," he explains. "But it doesn't say anything about cyber attacks." "We think that clearly means God would approve."